e-commerce is one of the most rapidly growing fields in our times, one which is changing the world at a great rate. The power of ordering things online and having them delivered to your doorstep without you even having to leave the house is miraculous and addictive. Owing to this growing trend, more and more e-commerce businesses are launching every year and are earning hefty profits. In research conducted by the analysts at Statista.com, the e-commerce market in America alone is worth $360.3 billion. 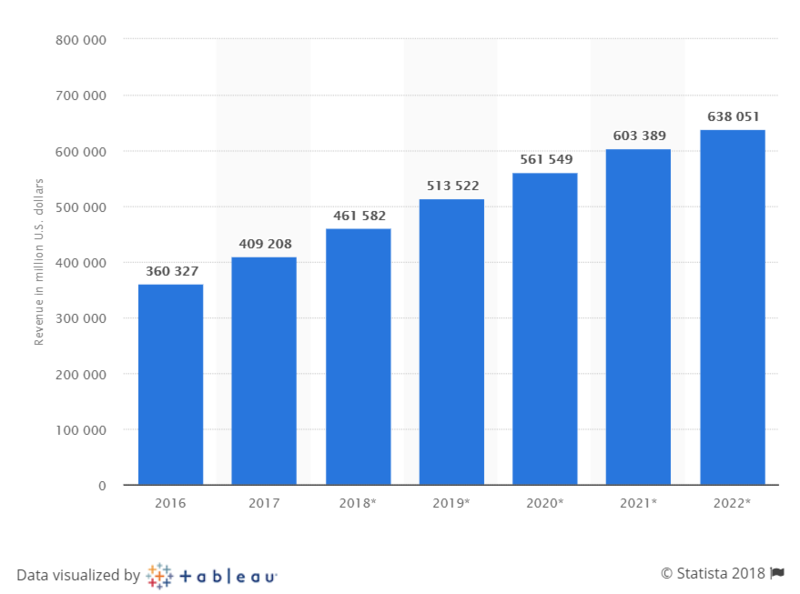 And by the year 2021, the US retail e-commerce sales are projected to reach $603.4 billion! With an increase in the number of mobile devices, shopping online is now easier than ever. You can shop in busses, in trains, while you’re stuck in traffics, while you’re at work. This has further induced a steep rise in the number of e-commerce businesses in the market. But now, the market is quickly becoming saturated; there are just too many options out there for the customers to choose from. Thus, the competition between various e-commerce sites like Flipkart and Amazon is now fiercer than ever. Each one is trying to beat the other and to do so, they are coming up with better and more innovative ideas. The key to success in this business is to stand out. With a properly built and well planned mobile application, you can start your own e-commerce business and stand out in the herd. So listed below are some of the essentials your e-commerce app need to have in order to be successful like Amazon. The very first thing that you need to do before starting your own e-commerce business is conducting a thorough research and market study. First, you need to figure out what you’ll be selling. Do you want to sell multiple things or do you want to focus on only one kind of commodity? Now once you have decided what you want to sell, you need to conduct a market study. Explore the age, ethnic, and social groups you need to target. Find out what your competitors are doing and what services they are providing on their apps. This will give you a vague idea of the essential features you need to have in your application. Furthermore, this will tell you which tactics worked for your competitors and which didn’t as much. For example, if you intend on selling books, then you can have a look at Amazon, which started as an online book retailer, and what they did to not only survive but to become the undisputed king of the e-commerce spectrum. The first thing which Amazon did right, was providing a stupendous collection of books, at very affordable prices. It offered a powerful search engine to its users to browse through its database of books. It offered them suggestions and various lists from which they could choose a book. Furthermore, the recommendation section, where users could select books according to their moods and reading preference, worked in Amazon’s favor as well. It offered its customers who were using the Amazon mobile app, gift package, and automatic notification system. It allowed its users to share their comments and reviews about the book, or the product that they received. It also let them surmise their review by giving them ratings in the form of stars. Now, once you have completed your research, it is time to start planning your app. Remember that it is considered a smarter move to get your application finished quickly and with only essential features, rather than wasting a lot of time trying to perfect it. Just put together a couple of necessary features, and release your application. If need be, it can always be enhanced later on. Furthermore, if you put an application out in a basic form, it is easier to make tweaks in it based on user reviews. When we say that start simple, we don’t mean that don’t put in any effort at all. This application still needs to be able to reel in customers. And no matter how basic your application is, it needs to have a user sign-in and login page. Now the key here is that you don’t harass your customers by asking them a bunch of unimportant questions. Keep it simple. Only ask for essential details and be done with it. Also, make sure that you add additional social media login and signup features as well. This aspect of your application should be very fast, and there should be a lot of advanced filtering options for the users to simplify and quicken their search. You might think that allowing users to comment and review your products will make you vulnerable. But the truth is, it will boost your sales. It is a well-known fact that new buyers trust customer reviews more than what is written in the product description. Every user fills his cart enthusiastically, but very few of them actually make the purchase. The biggest reason behind this is the complicated checkout process many apps use. You need to understand that users don’t want any sort of hassle, they don’t want to apply any amount of unwanted effort. So, if you are making them jump through many hoops to purchase items, they are simply going to abandon your app and find a new one. Remember, there is plenty of fish in the sea. Allow users to buy as guests. Don’t try to impose the Must Login to Buy restrictions on your users. Many users don’t have time to sit and sign up these days, so make sure you don’t alienate these busy users. Mankind is an impatient breed, and we don’t like to be kept in the dark. So show the checkout progress to your users. Maybe divide the process into a number of steps, that way users will know exactly how many steps they still have to go through. Don’t bombard your customers with a plethora of questions, keep the checkout process as simple as possible. Try integrating a safe and straightforward payment gateway. Also, don’t bind your users to just one option, give them a choice. Furthermore, make sure you only appoint popular and safe payment gateways with a good reputation. Whenever money is involved, security is the biggest concern, and if something goes wrong and some user’s payment is lost then, it will taint your reputation. The final feature in the list is Shipping. A big reason behind Amazon’s success is its reach. It has well-stocked warehouses everywhere which allows it to ship goods quickly. Speed is everything, and customers are very impatient. They want their goods shipped as soon as possible so make sure you take care of that. Tell users estimated delivery date as well, so that they have a date to look forward. The first impression is the last impression. If you are not wooing your customer the second he opens your app, you are in trouble. So make sure that you choose a professional design for your app. The visuals of your app will influence the user’s opinion of your app significantly. So make sure you don’t mess up. Logo: A clean, creative, innovative, sometimes even funny, the logo will do wonders for your business. Your logo is the identity of your app. On Google play store on the Apple App Store, everywhere, your app will be recognized by your logo. So make sure that it is as eye-catching as possible, or else, you won’t even get a chance to show customers your app. Make sure that you follow a color scheme which makes the goods on the application stand out. Provide product pictures from various sides. Now the next stage involves deciding the platform for your application. The most prominent choices in the market are Google’s Android and Apple’s iOS. Now both of them are highly in demand and are famous in their circles. While iOS rules in North America and Europe, other parts of the world trust Android. So here is the biggest question that you’ll need to answers, and answer to it will depend on a couple of factors. First, your clients. Are you targeting wealthy or middle-class customers? Because it is a well-accepted fact that rich people own iPhones while most middle-class customers go for Android, given the fact that it is cheaper. Secondly, the geographical separation which we mentioned above will influence your decision as well. Are you targeting customers in Europe and North America, or outside them? Then, the final thing you need to keep in mind is the time it takes for an application to be built on each of these platforms. Android, has many variants. The devices are of varying sizes, and due to its open-source nature, every company makes few tweaks in it before releasing a new phone. So making an app for Android is tricky, since it needs to be developed for many platforms. On the other hand, Apple applications are finished quickly, since it has only a handful of devices. Customers will have issues, always. Either with your app functionality, or your products, or something else. The bottom line is, they will have complaints, and you need to figure out a way to make it easier for them to pass that complaint to you. Giving a contact number in the footer is no longer enough. It is very rare these days that the customer will close your app and call on the number you have provided. So be available for them through the app. And the last thing which decides the fate of your app is the promotion. Don’t underestimate the power of publicity, you need people to know and be intrigued about your application even before it is released. Social media platforms such as Facebook and Twitter are powerful promotional tools. Your presence on these platforms is must these days. Also, try to be as active on them as possible. Managing a blog is also a good promotional tool as well. This is a good way of sharing your ideas and some news you might have with your customers. The process, of course, doesn’t end here. As we mentioned at the beginning as well, you can always enhance your application. The process never ends. So keep in mind that you take customer reviews very seriously. There are a lot of other ways for you to keep your customers interested, like giving them app e-wallet credits, coupons, exclusive deals. In conclusion, your app needs to become a necessity to your users, only then will it have any chance of surviving in this cut-throat market.